Homemade dog treat recipes are so much fun to make, especially when you know your dog will love them. You'll want to keep this recipe in the regular rotation of homemade dog treats to make because your dog will flip for the meaty flavor of these little morsels. Use these treats to hide vitamins or medication. The meaty flavor will mask odors and make medication time a welcome part of the day. This is a wonderful dog treat recipe for our dog friends who must be on a prescription diet dog food. Check with your Veterinarian to make sure the other ingredients are safe and healthy if your dog is on a special diet. Cook the ground beef, breaking apart into very small pieces. Once cooked through, pour off the grease. Pour the dog food into a food processor or blender and grind to a coarse flour. Whisk together the coarse dog food and bread crumbs in a medium bowl. Stir together the meat, honey and applesauce in a separate small bowl. Stir the meat mixture into the dry mixture until combined. Using a small cookie scooper, hand pack the scooper. Press firmly to get as much in as you can. Place on the prepared sheet. Place in your freezer until frozen, approximately 2 hours. Storing - This frozen treat, like many homemade dog treat recipes, needs to be kept in the refrigerator or freezer. Keep in the freezer for up to 4 months. Yield - Using a 1 inch cookie scooper, you will yield about 40 meatballs. Serve Fresh - If your dog is not partial to frozen treats, or if you live in a cooler climate, you can serve them fresh. Keep them in the refrigerator and serve within a week. Freeze any extras for later enjoyment. Where's the Beef? 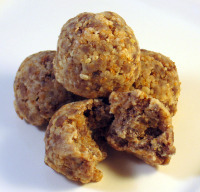 - You can substitute ground turkey, chicken or buffalo for this homemade dog treat. Substitute Flour - If you do not have a food processor or blender strong enough to grind dry dog food, you can substitute whole wheat flour instead. Or, if your dog has a sensitivity to wheat or gluten, use potato, brown rice or oat flour. Raw or Cooked - We will not discuss the debate of serving raw or cooked meat to your dog. But I will say that this recipe works well with both raw or cooked ground meats. Vegetables - If you want to get more veggies into your dogs diet, this is a great dog treat for that. You can easily incorporate peas, green beans or shredded carrots into this meatball dog treat. If you have a large dog, you can make meatballs with an ice cream scooper to satisfy the larger appetite. These dog treats also make a tasty yap-petizer for a dog party, too. Don't forget about using these meatballs as dog training treats. Instead of using the scooper to form the treats, you could leave it as is, once combined, as little training crumbles. With so many ways to use versatile homemade dog treat recipes, you may never need store bought treats again. If we use whole wheat flour, does it have to be cooked?